I bought my 964 when I was 20 years old. Probably not the best financial decision at the time, but I did it anyways. I knew nothing about Porsches, but after one test drive, I knew that this 964 had to be mine. 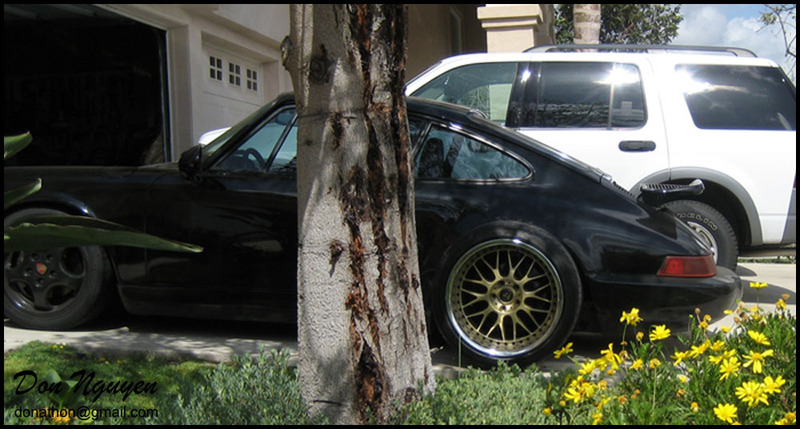 Since then, there have been several times that I have come close to selling my 964. 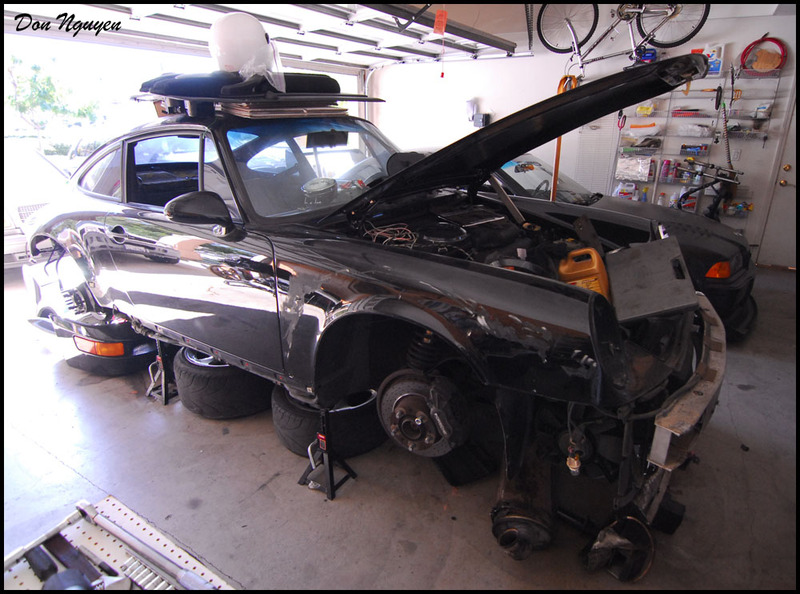 Whether the reason was due to lack of resources or not enough time to build and restore my 964 into the car that I had hoped and imagined it would be. However, luckily, I never went through with selling my 964, as it would have probably been my single biggest automotive decision that I would have regretted making. It's now or never. I like Porsches, I like American V8s, and I like race cars. What am I alluding to? Well, to simply put it, I will be taking my Porsche 964 and putting a Chevy LS based engine into it with the overall end results of a streetable race car. Because what fun, really, is a car that can't be driven whenever you wanted to. However, to me speed is only one part of the equation. The car's going to take on styling cues of a race car from the exterior, but have a relatively tolerable and factory-esque interior, aside from a few various interior race bits here and there. I like to think of it as a wolf in wolf's clothing. Sounds wrong in every way? Sounds perfect to me. Speed, handling, styling, and comfort. The best part about building a car how you want it is that there is no bad part. Why? I will only answer this question once. Because. No fancy tools, no fancy garage, no team of engineers. One man, one car, and countless hours spent doing research. 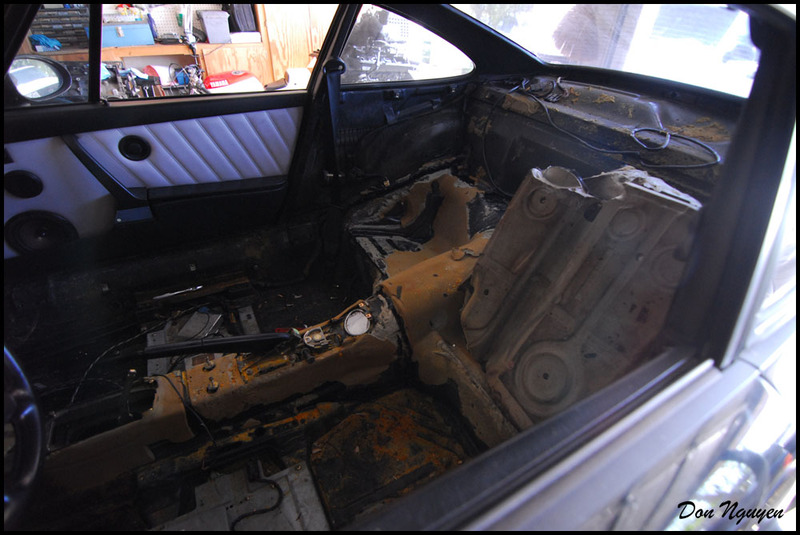 I will be doing as much of the fabrication myself as possible, from building the engine mounts to redoing all of the leather work on the interior. I can go into details and tell you all of my plans and ideas for the car, but what fun would that be if I told you everything upfront and didn't leave a little bit of mystery to it. As I was always taught, show, not tell. You'll just have to tune in and watch as the progress goes along. I am not trying to build the best car in the world, but to build my perfect car, which to me makes it the best car in the world. This is how the car looked like when I first bought it. These pictures were actually taken from the original ad that were used by the previous owner. Funny thing is, I actually did not remember saving these pictures, but I randomly happen to stumble across them the other day when looking for something else. It took me only one week of searching to find my 964 and it took me only one more week after that before I put in an order for a set of coilovers for my car. I figured why wait to buy them, when I could buy them now and enjoy it right away. This is ultimately what the car last looked like before I decided to put it up on jack stands and start the reconstruction process. Keep in mind, all of these pictures that I have posted thus far, including this one, are from over a span of several several years. As of yesterday, this is how the car looked like. I actually had started taking the car apart before I decided that I would take pictures and document my build. I was never really one to start or have any detailed build threads for any of my other project cars, but I felt like this is one that I would share the process and progress as it goes along with you guys. Good luck and congrats on undertaking this project! Can't wait to see how it progresses. Since you mentioned it being a street/track machine - are you planning to have a cage built for the car? I would also imagine you are planning to redo the interior - aftermarket seats or trying to keep it stealth? No cage. Most likely will just have a roll bar installed in the rear. Cage is too much for the street. Even some would argue that a roll bar is too much, but that's a whole nother debate within itself. I have a set of bucket seats for the car already at the moment. Just need to figure out what mounting system I want to use. Cool, just wanted to see what scale you were going for. I figure a half-cage like they do for the GT3s would be fine for street-use, but I guess it does eat up the back of the car, making it harder to haul things around. Sticking the V8 in there, you might be modifying the firewall anyway, so that may not be a big concern. On the seats - if they are a fixed bucket, I would recommend using Recaro flat-mount sliders (since they bolt right to the factory mounts) and then a good adjustable side-mount bracket like the aluminum units we make. They offer a lot of adjustment for height and rake, but also have large slots on the base to offer a lot of width adjustment for narrow to wide seats. What seats are you putting in, if you don't mind me asking? I suppose it'll make hauling things around a bit harder, but I don't plan on using the car to do much of that anyways. I won't be modifying the firewall. Only thing I don't like about the Recaro side mounts is that the ones I have seen only have one slot in the front. I may go with Status racing seat mounts, since they have multiple slots in front and rear for adjustability. I could stick with the Status sliders as well, but I think the Recaro sliders feel more solid. Currently have a set of Status racing cf backed ring seats that will most likely be used in this car. I have another pair of the same seats but kevlar backed in my M3 and they fit me well. I will probably keep stock seat belts in the car, but also add some Schroth harnesses to the car for track days. They work great with the Recaro slider (which I agree is very solid feeling) and give you a lot of mounting options for the seats. No plans to modify the firewall though, I figure it would make the work much easier, but I guess you may not need to depending on the motor configuration. You said you are going to do all the fabrication work yourself - Do you have an idea on an exhaust to modify or are you going to try to build one 100% custom? Your mounts look pretty solid. Status contacted me recently and they are going to try and work on getting me a set of mounting hardware at the moment. As far as exhaust goes, if I wanted to go the easy route, I can use off the shelf short tube headers. However, if I did that I'd be leaving roughly 30rwhp on the table if I didn't go with a long tube header set up. Ideally, I'd like to make a set of long tube headers work, for both performance and sound. There's a lot of room back there, so I am sure it'll be possible. Sounds good, going with a long-tube header would definitely be ideal. Excited to watch progress on this project! 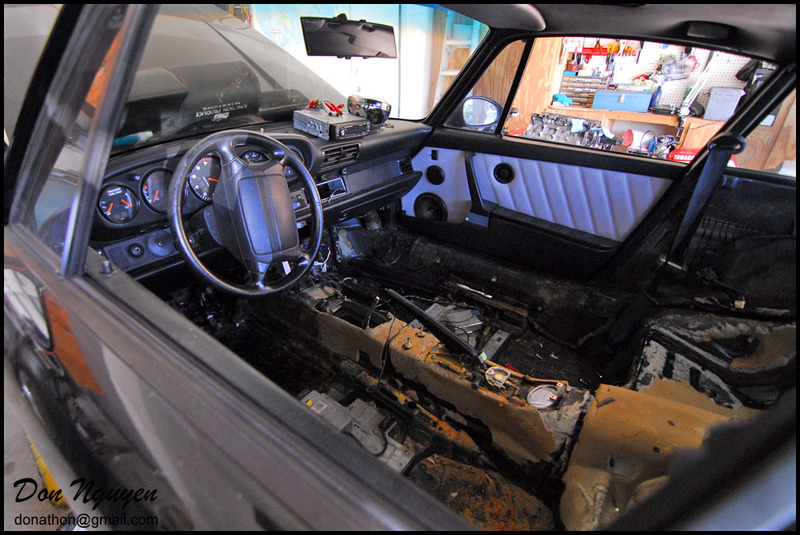 Completely took the dash apart/out and removed some more of the sound deadening/padding. I am going to try and remove as much as I can before relaying new padding down. Not sure what would work best, so I'll take any suggestions if anyone has any experience with this. I've read/heard that closed cell foam padding was a good option. Pile of misc parts and wires that were removed. One of the other reasons why I wanted to go through the whole car, which was to find any rust spots that would be developing such as what I found here around the rear quarter windows. Not sure if this was like this from the factory, but it seems like someone's removed these before and used 3M double sided tape to put these trim pieces back on. With older cars, you never know where someone before you could gone/been through before. I will most likely be using the 993 window seal for the rear quarter windows, which will delete the need for that trim piece that was removed. Random shots of the engine bay and car as it sits now. Here's a picture that I pulled off of my instagram, @don__nguyen with double underscores in between the name, for those that use it and if you want to follow me for miscellaneous updates. Sometimes I don't get around to posting all of my updates/pictures on the forums, since it's easier for to just upload directly to a source such as instagram. Bought a used short block, so naturally I had to take it all apart to check and make sure everything was ok. I am going to go ahead and get the cylinders bored out slightly bigger, oversized forged pistons to match the new bore of the block/cylinder once it gets machine, get the crank cleaned up and get new bearings (con rod, cam, and mains). Did not really get any further progress on the Porsche this weekend. Instead, I chose to autocross my E70 X5 with the BMW CCA group. Gotta make sure all of the tools in the shed are sharp. There were a total of 13 cars in my class, I came in 5th. Got beat by three turbo charged 135//335s by about a second and lost out to first place (2013 335i) by 3.5 seconds on a ~60-65 seconds length course. Here's a video of my run. The video was kind of quickly put together. It's been a long while since I last did any sort of video editing. It was also my first time using my new gopro hero 3s to shoot video with. That's not to say I don't have any pictures of my Porsche that I can't share with you guys though. Nothing special, but at least it gives you something to look at. This picture is from at least 4 years ago when I was first test fitting wheels on my widebody E36 M3 and for fun I put the wheel next to my Porsche to see what it would look like. 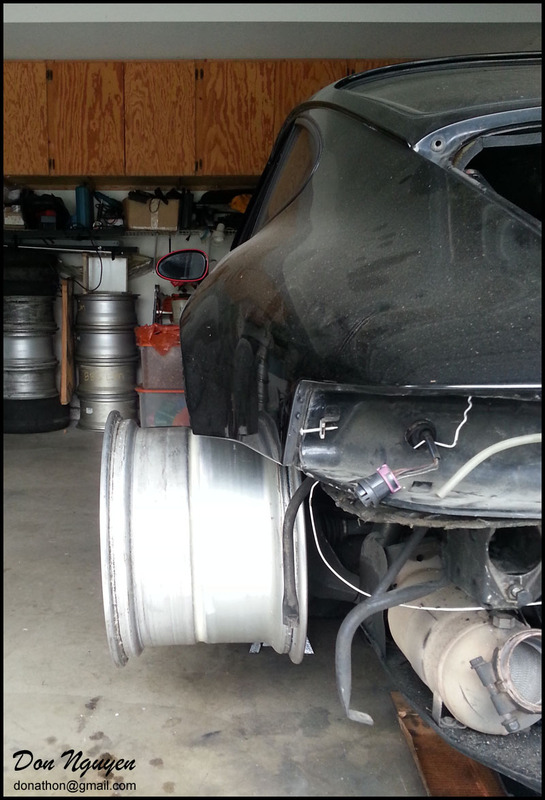 Here's a more recent picture of a different, but similarly sized wheel on my Porsche, to gauge roughly how far out my flares are going to have to be. Nope. Won't be making the flares. I will be using metal flares, and modifying them as needed.